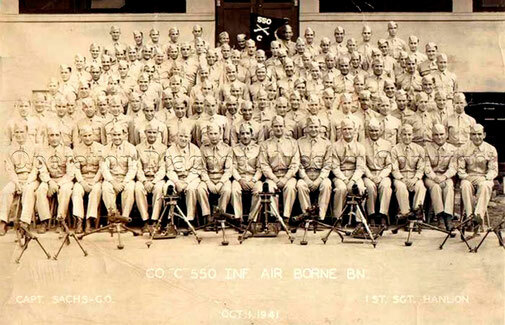 MARKS Lester, 550th Glider Infantry Battalion - Site de operationdragoon ! In the regular army since 1938, Marks spent three years in Honolulu. He went overseas in October, 1943. In 1941, he re-enlisted and was sent to the Panama Canal Zone. After two years there he was transferred to the Caribbean area. He then returned to this country and was sent to Italy and then to Southern France. 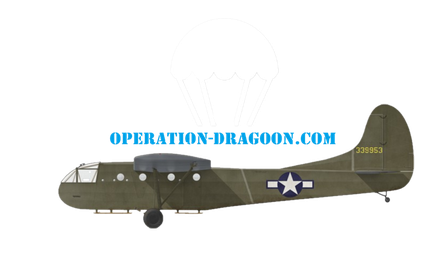 The 15 of August 1944, Lester and his unit land by glider in the LZ "O" ( Le Mitan ) at 18h30. Two hours after landing the main force was assembled and under control of Lt Col Edward SACHS, battalion comander. The area around Le Muy had been cleared, and the unit assigned the town of Le Muy as an objective failed in his mission. This is now the 550th Glider Infantry Battalion task. At 02h30 the 16th of august, the entire battalion is ready and prepare for the attack. After a 15 minutes light artillery barrage, "A" and "C" Company begin to progress to the town from north east with "B" Company on reserve. Ennemy machine guns and sniper opened fire immediately. At 06h00 the battalion withdrew to reorganize. At 11h40 a second attack is launched, with support of heavy weapons. 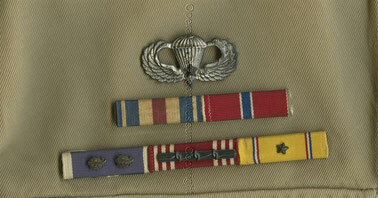 For his work in routing a German detachment from a prepared position and capturing 15 men, Pfc. Lester A. 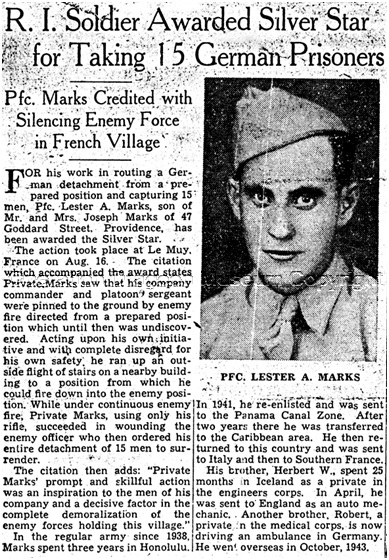 Marks, son of Mr. and Mrs. Joseph Marks of 47 Goddard Street, Providence, has been awarded the Silver Star. The action took place at Le Muy, France on Aug. 16 . The citation which accompanied the award states Private Marks saw that his company commander and platoon sergeant were pinned to the ground by enemy fire from a prepared position which until then was undiscovered. Acting upon his own initiative and with complete disregard for his own safety, he ran up and outside a flight of stairs on a nearby building to a position from which he could fire down into the enemy position. While under continuous enemy fire, Private Marks, using only his rifle, succeeded in wounding the enemy officer who then ordered his entire detachment of 15 men to surrender. The citation then adds: “Private Marks’ prompt and skillful action was an inspiration to the men of his company and a decisive factor in the complete demoralization of the enemy forces holding this village. Except isolated snipers, the town was secured by 15h00, approximately 700 ennemy captured, undetermined number killed. The 550th GIB lost 1 killed in action and 15 wounded in taking the town. 8 killed and 20 injured in the glider landing. After the taking of Le Muy, the unit is sent to the Champagne front, in the mountains North of Nice, and then to the Bulge. 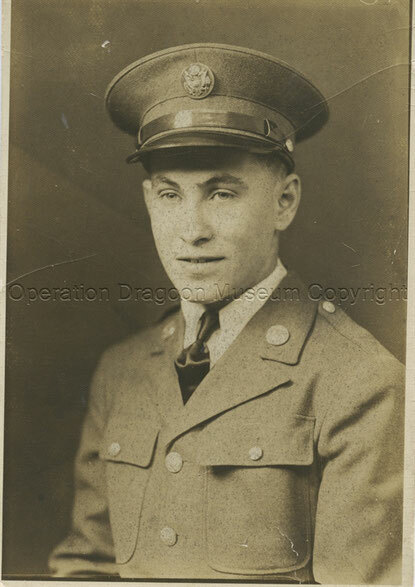 Lester MARKS will be wounded and captured during the battle of the Bulge, and was a prisonner of war in Nazi Germany.. Thankefully, he had the foresight to throw away his dog tags including his religious identification. 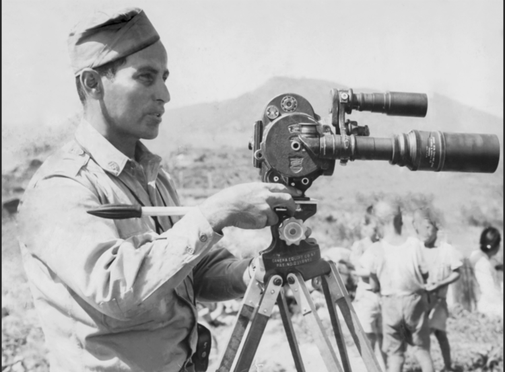 After the war, he trained as a motion picture cameraman and joined the US Army Signal Corps. He was the first photographer to parachute into war and filmed the 187 Regimental Army airdrop into Korea. He was the sole cinematographer for the operation Blue Jay, the 22 of september 1952, the biggest secret operation since D Day. His daughter Mary MARKS created a very interesting tribute to his father on her website. Click here for more information. 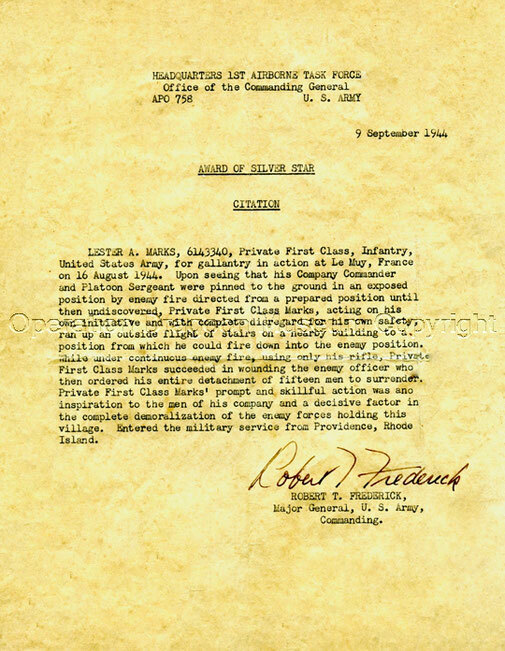 Lester MARKS, Silver Star citation for action in Le Muy, August 16 1944. C'est magnifique! Tres bien! Mazel Tov! Merci beaucoup!! I am thrilled that you found my website and shared the story about my father’s Silver Star. This is such an honor. Thank you so much! This is awesome Mary . . . so great to learn this history of Uncle Les . . . thank you for making and sharing this . . . I will come back to this many times . . . best wishes to you and yours . . .